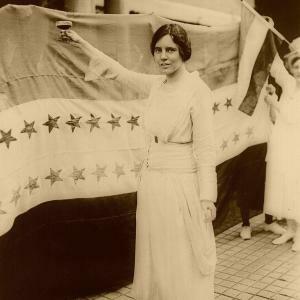 In this centennial year of women’s right to vote, Actress and Scholar Leslie Goddard, Ph.D., portrays suffragist Alice Paul, one of the most dynamic leaders in the fight to win votes for women. An innovative and tireless worker, Paul arranged parades, organized the first picketing demonstrations outside the White House, lobbied politicians, and endured imprisonment for women’s suffrage. As fearless as she was pioneering, she remains an icon in the struggle for equal rights. FREE for Members / $3 for Guests. Sign-up for the Elgin History Museum newsletter?